The most common symptom of PAD is claudication (leg pain) that occurs when walking but disappears during rest. Other symptoms include numbness, leg cramps, cold legs or feet, and skin discoloration. Blocked blood flow to the legs can raise the risk of getting an infection and cause ulcers that do not heal in the affected limbs. 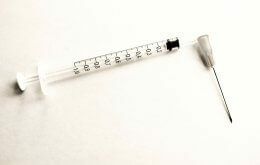 In very serious cases, it can lead to tissue death (gangrene) and inevitably leg amputation. PAD affects more than 30 million people worldwide but less than half are diagnosed and hence the disease is seriously under-treated. Symptoms of PAD are often wrongly attributed to old age. Common risk factors include smoking, diabetes, obesity, high blood pressure, lack of exercise, family history of atherosclerosis and increasing age. 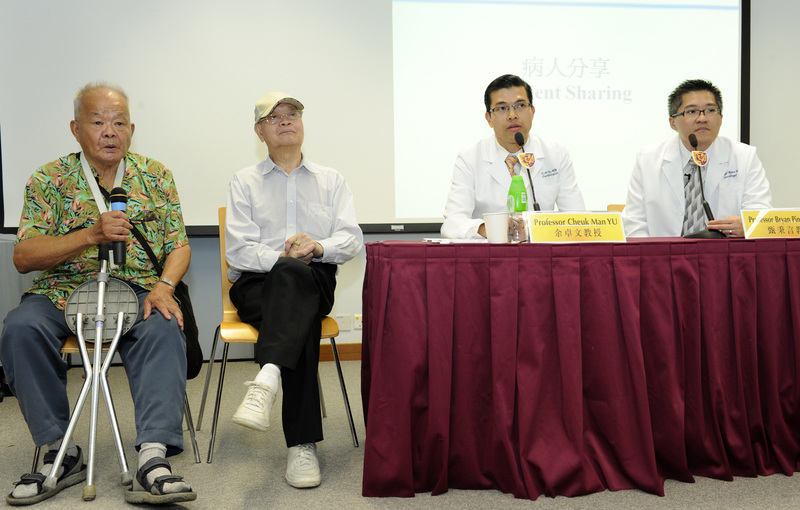 The prevalence of PAD in Hong Kong is not well studied. It is estimated that up to 30% of high-risk populations suffer from PAD. As the incidence of PAD increases with age, the prevalence of PAD is expected to rise with an aging population. On average, patients with PAD live 10 years shorter and are faced with up to six times higher risk of death from cardiovascular causes. Although PAD can be life-threatening, it is treatable if detected early. Main treatments include lifestyle changes, medications, surgery and endovascular procedures. Clinical data strongly support that patients with critical limb ischemia (CLI, patients who experience rest pain, ulcer or gangrene) should undergo vascular assessment and prompt revascularization to avoid amputation. If CLI is left untreated, mortality rate is up to 30% and amputation is almost inevitable by one year. Unfortunately, in Hong Kong, the majority of severe PAD patients with CLI are still treated with primary amputation. 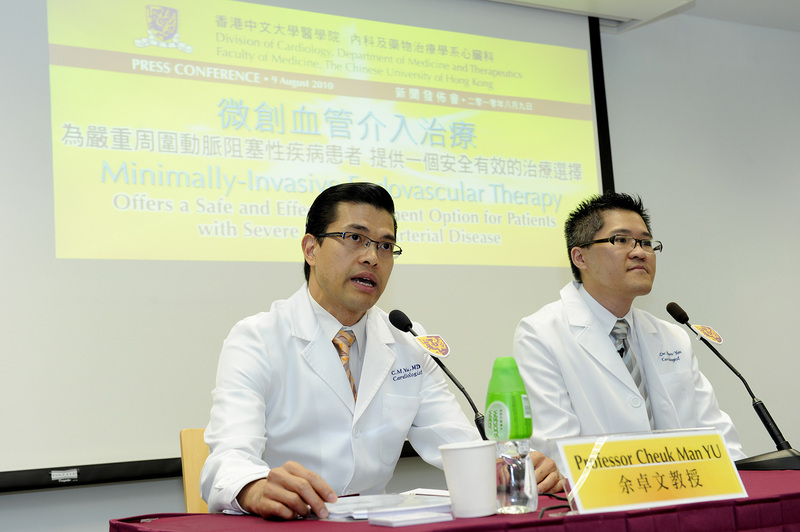 Professor Yu Cheuk-man and Professor Yan Ping-yen Bryan, Division of Cardiology, Department of Medicine and Therapeutics and the Institute of Vascular Medicine at The Chinese University of Hong Kong (CUHK), in collaboration with Professor James Lau Yun-wong, Division of Vascular Surgery, Department of Surgery at CUHK have initiated a combined medical and surgical vascular service for patients with severe PAD. Patients would undergo clinical and non-invasive vascular assessments including ankle-brachial index, segmental pressure and pulse volume recordings, duplex ultrasound, CT or MR angiography and would then be recommended for suitable treatment options: medical, minimally-invasive endovascular therapy, bypass surgery or the combined endovascular and surgical therapies (“hybrid” procedure). Minimally-invasive endovascular therapy aims to widen narrowed or blocked arteries with balloon angioplasty, stenting and or atherectomy (removal of plaque). Bypass surgery involves attaching a vein from another part of the body or a synthetic blood vessel above and below a blocked area to detour blood flow around the blockage. When compared to the surgical approach, endovascular therapy is performed with local anesthesia which enables the treatment of patients who are at high risk for general anesthesia. The morbidity and mortality from endovascular procedures are lower. In patients who are poor candidates for surgery, endovascular therapy may offer the only opportunity to save the limb with a limb salvage rate of up to 80% at three years. Endovascular therapy generally do not preclude or alter subsequent surgery, and may be repeated if necessary. In selected patients, surgical and endovascular therapies can be combined in so called “hybrid” procedures for better clinical outcomes. From February 2009 to July 2010, endovascular procedures were performed on 35 patients with severe PAD at the Prince of Wales Hospital. About 50% of procedures were performed for limb salvage in patients with CLI. Majority of patients had significant co-morbidities and were high risk for bypass surgery, 71% were diabetic, 67% had coronary artery disease, 26% had previous stroke and 41% had kidney failure. Procedural success was 95%. At a mean follow-up of six months, majority of patients experienced significant improvement in walking distance or wound healing. Over 80% of patients with CLI had their limbs preserved. In conclusion, endovascular therapy offers a less invasive, safe and effective treatment option for patients suffering from severe PAD. While effective treatment options are available, early detection and intervention is imperative in order to reduce the risk of amputation and mortality associated with PAD.